The Crafty Thinker: Stephanie Fischer - Independent Stampin' Up Demonstrator: DSP leftovers! 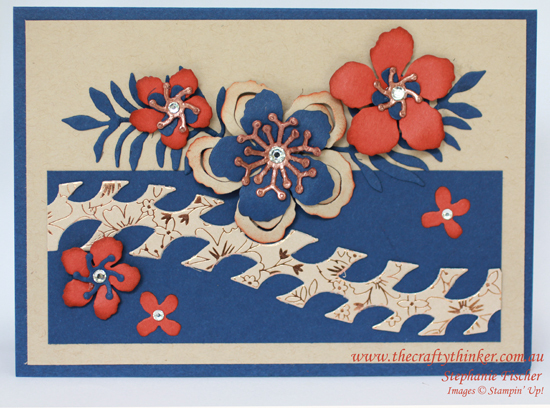 Since it's Friday, my card today is entered into the Crazy Crafters Project Highlights. Click here to see all the other entries and vote for your favourites. This card started with a piece of Affectionately Yours DSP leftover from a previous card. The paper is too beautiful to waste any! The Affectionately Yours DSP is just too gorgeous to hit the bin! I layered my curvy piece of DSP onto some Night of Navy cardstock and then layered that onto some Crumb Cake cardstock which I placed on a Night of Navy card. I quickly cut some decorations with the Botanical Builder framelits using Night of Navy, Crumb Cake and Cajun Craze cardstock. To bring out the copper in the DSP, I copper heat embossed a small piece of Cajun Craze cardstock and cut out some flower centres . I lightly sponged the edges of the Crumb Cake flower, assembled my decorations and finished with some Rhinestones. Did you notice - there's no stamping on this card!